Background: We screened a large library of differently decorated imidazo-pyrazole and pyrazole derivatives as possible new antitubercular agents and this preliminary screening showed that many compounds are able to totally inhibit Mycobacterium growth (>90 %). Among the most active compounds, we selected some new possible hits based on their similarities and, at the same time, on their novelty with respect to the pipeline drugs. Methods: In order to increase the potency and obtain more information about structure-activity relationship (SAR), we designed and synthesized three new series of compounds (2a–e, 3a–e, and 4a–l). 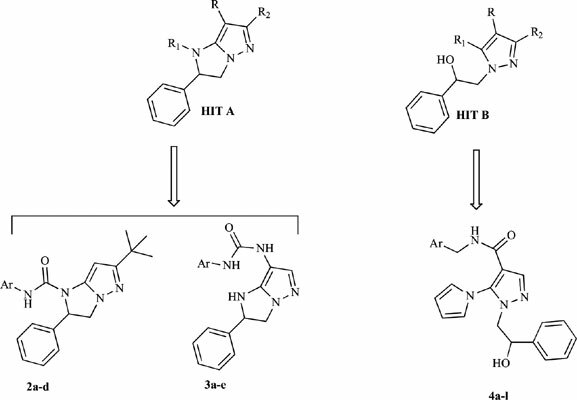 Conclusion: Performed tests confirmed that both new pyrazoles and imidazo-pyrazoles could represent a new starting point to obtain more potent compounds and further work is now underway to identify the protein targets of this new class of anti-TB agents. Pyrazole, imidazo[1, 2-b]pyrazole, antitubercular agents, MABA, LORA, Tuberculosis (TB).